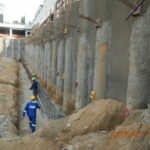 Pieter Oosthuizen has more than 15 years of engineering experience, mostly relating directly to the fields of geotechnical engineering and geosynthetics. As a specialist consultant Pieter has mainly been involved in the fields of soil and rock slope stability, tunnelling, retaining structures, piles, lateral support, geotechnical site investigations, dolomite stability investigations and geosynthetics. A special area of interest is non-linear, finite element modelling of soil/structure interactions using state-of-the-art geotechnical design software.